Control design, implementation, and evaluation for an in-field 500 kW wind turbine with a fixed-displacement hydraulic drivetrain Control design, implementation, and evaluation for an in-field 500kW wind turbine Sebastiaan Paul Mulders et al. The business case for compact hydraulic wind turbine drivetrains is becoming ever stronger, as offshore wind turbines are getting larger in terms of size and power output. Hydraulic transmissions are generally employed in high-load systems and form an opportunity for application in multi-megawatt turbines. The Delft Offshore Turbine (DOT) is a hydraulic wind turbine concept replacing conventional drivetrain components with a single seawater pump. Pressurized seawater is directed to a combined Pelton turbine connected to an electrical generator on a central multi-megawatt electricity generation platform. This paper presents the control design, implementation, and evaluation for an intermediate version of the ideal DOT concept: an in-field 500 kW hydraulic wind turbine. 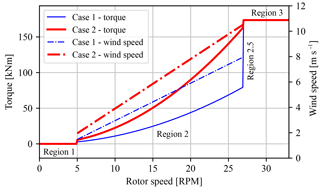 It is shown that the overall drivetrain efficiency and controllability are increased by operating the rotor at maximum rotor torque in the below-rated region using a passive torque control strategy. An active valve control scheme is employed and evaluated in near-rated conditions. Mulders, S. P., Diepeveen, N. F. B., and van Wingerden, J.-W.: Control design, implementation, and evaluation for an in-field 500 kW wind turbine with a fixed-displacement hydraulic drivetrain, Wind Energ. Sci., 3, 615-638, https://doi.org/10.5194/wes-3-615-2018, 2018. Figure 1Schematic overview of an ideal DOT hydraulic wind turbine configuration. A radial piston seawater pump is coupled to the rotor in the nacelle. The flow is converted to a high-velocity water jet by a spear valve, and a Pelton turbine–generator configuration harvests the hydraulic into electric energy. Multiple turbines can be connected to the central power generation platform. The drivetrain of horizontal-axis wind turbines (HAWTs) generally consists of a rotor–gearbox–generator configuration in the nacelle, which enables each wind turbine to produce and deliver electrical energy independent of other wind turbines. While the HAWT is a proven concept, the turbine rotation speed decreases asymptotically and torque increases exponentially with increasing blade length and power ratings (Burton et al., 2011). As offshore wind turbines are getting ever larger, this results in a lower rotation speed and higher torque at the rotor axis. This inevitably leads to design challenges when scaling up conventional turbine drivetrains for the high-load subsystems (Kotzalas and Doll, 2010). The increased loads primarily affect high-weight components in the turbine, such as the generator, bearings, and gearbox, and makes repair and replacement a costly and challenging task (Ragheb and Ragheb, 2010; Spinato et al., 2009). Furthermore, due to the contribution of all nacelle components to the total nacelle mass, the complete wind turbine support structure and foundation are designed to carry this weight for the entire expected lifetime, which in turn leads to extra material, weight, and thus total cost of the wind turbine (EWEA, 2009; Fingersh et al., 2006). In an effort to reduce turbine weight, maintenance requirements, complexity, and thus the levelized cost of energy (LCOE) for offshore wind, hydraulic drivetrain concepts have been considered in the past (Piña Rodriguez, 2012). Integration of hydraulic transmission systems in offshore wind turbines seems to be an interesting opportunity, as they are generally employed in high-load applications and have the advantage of a high power-to-weight ratio (Merritt, 1967). It is concluded in Silva et al. (2014) that hydrostatic transmissions could lower drivetrain costs, improve system reliability, and reduce the nacelle mass. Various hydraulic turbine concepts have been considered in the past. The first 3 MW wind turbine with a hydrostatic power transmission was the SWT3, developed and built from 1976 to 1980 by Bendix (Rybak, 1981). After deployment of the turbine with 14 fixed-displacement oil pumps in the nacelle and 18 variable-displacement motors at the tower base, it proved to be overly complex, inefficient and unreliable. With the aim of eliminating the power electronics entirely by application of a synchronous generator, Voith introduced the WinDrive in 2003 that provides a hydraulic gearbox with a variable transmission ratio (Muller et al., 2006). In 2004, the ChapDrive hydraulic drivetrain solution was developed with the aim of driving a synchronous generator by a fixed-displacement oil pump and variable-displacement oil motor (Chapple et al., 2011; Thomsen et al., 2012). Although the company acquired funding from Statoil for a 5 MW concept, the company ceased operations. In cooperation with Hägglunds, Statoil modeled a drivetrain with hydrostatic transmission, consisting of a single oil pump connected to the rotor and six motors at ground level (Skaare et al., 2011, 2013). Each motor can be enabled or disabled to obtain a discrete variable transmission ratio to drive a synchronous generator. In 2005, Artemis Ltd. developed a digital displacement pump, meaning that it can continuously adjust its volume displacement in a digital way by enabling and disabling individual cylinders (Artemis Intelligent Power, 2018; Rampen, 2006). In 2010, Mitsubishi acquired Artemis Intelligent Power and started testing of its SeaAngel 7 MW turbine with hydraulic power drive technology in 2014 (Sasaki et al., 2014). 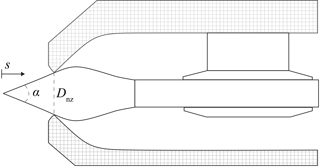 Figure 2The high power-to-weight ratio of the hydraulic components and the possibility to abandon power electronics from the nacelle make the advantages of mass and space reductions in the nacelle self-evident. The above-described full hydraulic concepts aim to eliminate power electronics from the turbine for the use of a synchronous generator and therefore use a mechanism to vary the hydraulic gear ratio. However, to date, none of the concepts have made their way to a commercial product. All concepts use oil as the hydraulic medium because of the favorable fluid properties and component availability, but therefore also need to operate in a closed circuit. Closed-circuit operation for an offshore wind application using oil is required to minimize the risk of environmental pollution, but also to abandon the need for a continuous fresh oil supply to the circuit. Furthermore, often an additional cooling circuit is needed when losses in hydraulic components are significant and natural heat convection to the surroundings is insufficient. A novel and patented hydraulic concept with an open-circuit drivetrain using seawater as the hydraulic medium is the Delft Offshore Turbine (DOT) (Van der Tempel, 2009), and it is shown in Fig. 1. The open circuit is enabled by the use of preconditioned seawater and alleviates the need for a cooling circuit by the continuous fresh supply. The DOT concept only requires a single seawater pump directly connected to the turbine rotor. The pump replaces components with high maintenance requirements in the nacelle, which reduces the weight, support structure requirements, and turbine maintenance frequency. This effect is clearly visualized in Fig. 2. All maintenance-critical components are located at sea level, and the centralized generator is coupled to a Pelton turbine. Turbines collectively drive the Pelton turbine to harvest the hydraulic into electrical energy. A feasibility study and modeling of a hydraulic wind turbine based on the DOT concept is performed in Diepeveen (2013). Hydraulic wind turbine networks employing variable-displacement components are modeled and simulated in Jarquin Laguna (2017). Using the DOT concept, a wind turbine drivetrain to generate electricity and simultaneously extract thermal energy has also been proposed in Buhagiar and Sant (2014). This paper presents the first steps in realizing the integrated hydraulic wind turbine concept by full-scale prototype tests with a retrofitted Vestas V44 600 kW wind turbine, the conventional drivetrain of which is replaced by a 500 kW hydraulic configuration. A spear valve is used to control the nozzle outlet area, which in effect influences the fluid pressure in the hydraulic discharge line of the water pump and forms an alternative way of controlling the reaction torque to the rotor. Preliminary results of the in-field tests were presented earlier in Mulders et al. (2018a). The main contribution of this paper is to elaborate on mathematical modeling and controller design for a hydraulic drivetrain with fixed-displacement components, subject to efficiency and controllability maximization of the system. The control design is based on steady-state and dynamic turbine models, which are subsequently evaluated on the actual in-field retrofitted 500 kW wind turbine. Furthermore, a framework for the modeling of fluid dynamics is provided, a parameter study on how different design variables influence the controllability is given, and future improvements to the system and control design are proposed. The organization of this paper is as follows. In Sect. 2, the DOT configuration used during the in-field tests is explained, and drivetrain components are specified. Section 3, which involves drivetrain modeling, is divided into two parts: a steady-state drivetrain model is derived in Sect. 3.1, and a drivetrain model including fluid dynamics is presented in Sect. 3.2. Controller design is presented in Sect. 4, and the steady-state model is used in Sect. 4.1 for the design of a passive control strategy for below-rated operation. In Sect. 4.2 the dynamic model is used to derive an active control strategy for the region between below- and above-rated operation (near-rated region). Because the in-field tests are performed prior to theoretical model derivation and control design, preliminary conclusions from these tests are incorporated. In Sect. 5, in-field test results are presented for the evaluation of the overall control design. Finally, in Sect. 6, conclusions are drawn and an outlook for the DOT concept is given. In this section, the intermediate prototype DOT turbine on which in-field tests are performed is described in Sect. 2.1. Subsequently, the drivetrain components used for the intermediate concept are discussed in Sect. 2.2. 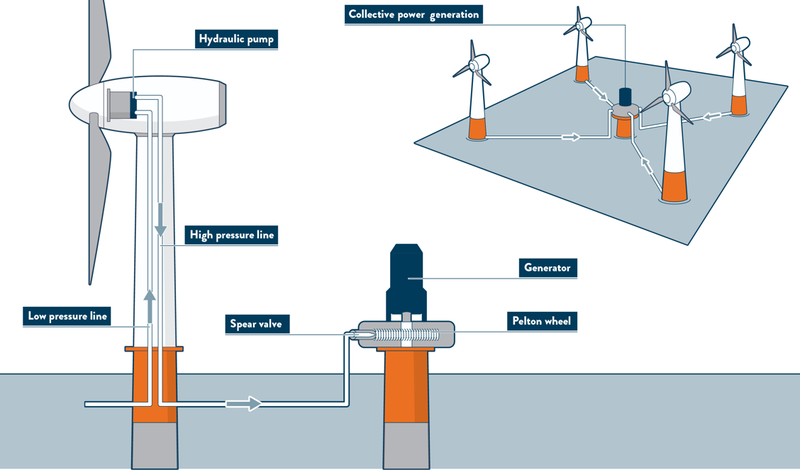 Figure 3Overview of the intermediate DOT500 hydraulic wind turbine configuration. An oil pump is coupled to the rotor low-speed shaft in the nacelle and hydraulically drives an oil motor in the bottom of the tower. This closed oil circuit serves as a hydraulic gearbox between the rotor and water pump. The motor is mechanically coupled to a water pump, which produces a pressurized water flow. The flow is converted to high-velocity water jets by spear valves and a Pelton turbine–generator configuration harvests the hydraulic into electric energy. At the time of writing, a low-speed high-torque seawater pump required for the ideal DOT concept is not commercially available. This pump is being developed by DOT, enabling the ideal concept in later stages of the project (Nijssen et al., 2018). An intermediate setup using off-the-shelf components is proposed to speed up development and test the practical feasibility. A visualization of the DOT500 setup is given in Fig. 3. A Vestas V44 600 kW turbine is used and its drivetrain is retrofitted into a 500 kW hydraulic configuration. The original Vestas V44 turbine is equipped with a conventional drivetrain consisting of the main bearing, a gearbox, and a 600 kW three-phase asynchronous generator. The blades are pitched collectively by means of a hydraulic cylinder driven by a HPU (hydraulic power unit) with a safety pressure accumulator. The drivetrain of the Vestas turbine is replaced by a hydraulic drivetrain. This means that the gearbox and generator are removed from the nacelle and replaced by a single oil pump coupled to the rotor via the main bearing. In the retrofitted hydraulic configuration, a low-speed oil pump is coupled to the rotor and its flow hydraulically drives a high-speed oil-motor–water-pump combination at the bottom of the turbine tower. The oil circuit acts as a hydraulic gearbox between the rotor and the water pump. The water circuit, including the Pelton generator combination, is depicted in Fig. 1 as an ideal setup. It is known and taken into account that the additional components and energy conversions result in a reduced overall efficiency: the in-field tests show a below-rated efficiency in the range of 30 %–45 %, whereas in the above-rated region a drivetrain efficiency of 45 % is attained. However, the DOT500 allows for prototyping and provides a proof of concept for faster development towards the ideal DOT concept. From this point onwards, all discussions and calculations will refer to the intermediate DOT500 setup, including the described oil circuit (Diepeveen et al., 2018). A prototype was erected in June 2016 at Rotterdam Maasvlakte II, the Netherlands. The drivetrain component specifications are summarized in Table 1 and a schematic overview and photograph of the DOT500 setup is presented in Fig. 3. An exhaustive description of the component matching process for the DOT500 is described in Diepeveen (2013). The components are described according to the enumerated labels in the figure. Table 1Hydraulic oil pump, oil motor, and water pump specifications (Bosch-Rexroth, 2012; Hägglunds, 2015; KAMAT, 2017). Oil pump. The rotor drives a Hägglunds CB840, which is a fixed-displacement radial piston motor. The motor is used here as pump and is referred to as the oil pump in the remainder of this paper. The pump is supplied with sufficient flow and constant feed pressure of 21 bar to keep the piston bearings in continuous contact with the cam ring (Hägglunds, 2015). Load pins are integrated into the suspension of the pump in the nacelle to measure the pump torque. Oil motor. The high-pressure hydraulic discharge line of the oil pump drives a Bosch-Rexroth A6VLM variable-displacement axial piston oil motor (Bosch-Rexroth, 2012), configured here with a (maximum) fixed displacement. Water pump. The oil motor is mechanically coupled to a Kamat K80120-5G fixed-displacement water plunger pump (KAMAT, 2017). An external centrifugal pump supplies the water pump with sufficient flow and feed pressure of around 2.6 bar. Spear valve. The pressure in the water pump discharge line is controlled by variable-area orifices in the form of two spear valves. The valves are used to control the system torque and rotor speed in below- and near-rated operating conditions and form high-speed water jets towards the Pelton turbine. A schematic visualization of this system is shown in Fig. 4. The spear positions are measured and individually actuated by DC motors. The spear valves are actuated in such a way that only full on–off spear position actuation is possible. This means that either the spear moves forwards–backwards at full speed or the spear valve position remains at its current position. A deadband logic controller is implemented to enable position control of the valve within a predefined band around the set point. Pelton turbine. When the water flow exits the spear valves, the hydrostatic energy in the high-pressure line is converted to a hydrodynamic high-velocity water jet. The momentum of the jet exerts a force on the Pelton turbine buckets (Zhang, 2007). Pelton turbines are highly specialized pieces of equipment and are designed to meet specific conditional requirements (Brekke, 2001). The Sy Sima 315 MW turbine in Norway, for 88.5 bar of head pressure, is to date the largest known (Cabrera et al., 2015). The custom-manufactured Pelton turbine employed in the DOT500 setup is designed for the nominal pressure and the optimal speed conditions of the connected electrical generator. The pitch circle diameter (PCD) of the custom-manufactured wheel is 0.85 m and the nominal speed of the turbine is in the range of 1230–1420 RPM. According to the manufacturer, the optimal operational pressure is in the range of 60–80 bar for a nominal flow of approximately 58 L min−1 using two spear valves. The optimal ratio between the tangential Pelton and water jet speed is approximately 1∕2 (Thake, 2000) and is maintained by speed control of the asynchronous generator using a filtered pressure measurement. Further considerations on optimal Pelton operation under varying conditions are given below. Generator. 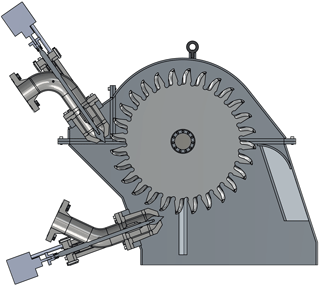 The mechanical rotational energy of the Pelton turbine is harvested by a mechanically coupled generator. As a grid connection was unavailable at the test location, the electrical energy excess is dissipated by a brake resistor. Figure 4The pressurized hydrostatic water flow is converted to a hydrodynamic water jet using spear valves. The high-speed jets exert a force on the buckets of the Pelton turbine. Figure 5Schematic overview of the DOT500 hydraulic wind turbine drivetrain. All pumps and motors have a fixed volume displacement. Charge pressure pumps and filters are included on the low-pressure sides of both the oil and water circuits. Pressure relief valves are incorporated in both circuits. A parallel circuit around the oil reservoir is present for cooling purposes. In addition to the components described in the above-given enumeration, auxiliary hardware is present and required for operation of the turbine. A more detailed description is presented in Diepeveen et al. (2018); however, a short summary of the relevant components and remarks is given. Cooling system. Because of the significant mechanical losses, the working medium needs to be cooled to enable long-term operation of the turbine. The pump and motor in the oil circuit are equipped with flushing lines, which lead to the oil reservoir. A parallel forced-convection cooling circuit regulates the oil temperature. Water circuit. After the high-velocity water jet has hit the Pelton buckets, it falls back into the first water reservoir. A second water reservoir is connected to the first by a high-volume line to prevent a disturbed flow to the water pump. From the second reservoir the water is fed to the water pump by a centrifugal pump. The high-pressure circuit includes a pressure relief valve. Furthermore, a remark has to be made on the operational strategy of the Pelton turbine. It is concluded from earlier tests and manufacturer data sheets that Pelton efficiency characteristics are mainly a function of flow and to a lesser extend of line pressure. The flow to the Pelton turbine is proportional to the wind turbine rotor speed, which results in suboptimal operation of the Pelton. The Pelton speed control strategy described above aims to extract the maximum amount of energy given the conditions it is subjected to. For now, this is a design choice, and further research needs to be conducted to elaborate on Pelton design and efficiency maximization given the varying operational conditions. The theory for model derivation of the DOT500 hydraulic drivetrain is presented in this section. As control actions influence the turbine operating behavior to the point at which the hydrodynamic water jet exits the spear valve, modeling of the turbine drivetrain is performed up to that point. After the water flow exits the spear valve, the aim of operating the Pelton turbine–generator combination at maximum efficiency is a decoupled control objective from the rest of the drivetrain. Considerations on this aspect are given in Sect. 2.2. A simplified hydraulic diagram of the setup is given in Fig. 5. The components considered in the model derivation are shown in black, whereas auxiliary systems are presented in gray. The symbols in this figure are specified throughout the different parts of this section. In this section, pressures are generally given as a pressure difference Δp over a component, but when the pressure with respect to the atmospheric pressure p0 is intended, the Δ indication is omitted. The organization is divided into two parts. First, a steady-state drivetrain model is derived in Sect. 3.1. This model is used later for the derivation of a passive torque control strategy. Secondly, in Sect. 3.2, a drivetrain model including oil line dynamics is derived and is used for the design of an active spear valve control strategy. A steady-state model of the drivetrain is derived for hydraulic torque control design in below-rated operating conditions. Mathematical models of hydraulic wind turbines have been established, but mostly incorporate a drivetrain with variable-displacement components (Buhagiar et al., 2016; Jarquin Laguna, 2017). In Skaare et al. (2011, 2013) a more simple, robust, and efficient drivetrain with a discrete hydraulic gear ratio is proposed by enabling and disabling hydraulic motors. Recently, a feedback control strategy for wind turbines with digital fluid power transmission was described in Pedersen et al. (2017). However, only fixed-displacement components are considered and modeling such a DOT drivetrain is described in Diepeveen (2013). The model derivation in this section incorporates the components employed in the actual DOT500 setup. A simplified wind turbine model is introduced in Sect. 3.1.1. This model is complemented in Sect. 3.1.2 by analytic models of drivetrain components. 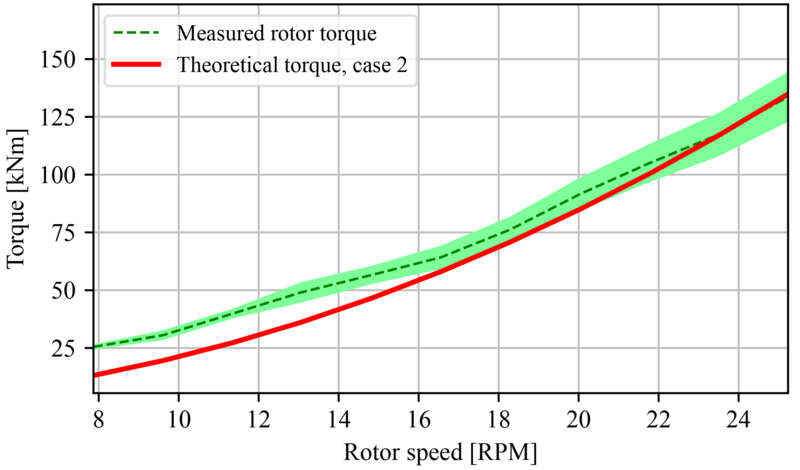 Figure 6Rotor power and torque coefficient curve of the rotor obtained from a BEM analysis performed on measured blade-geometry data. The maximum power coefficient Cp,max⁡ of 0.48 is attained at a tip-speed ratio of 7.8. The maximum torque coefficient of Cτ,max⁡ is given by 7.2×10-2 at a lower tip-speed ratio of 5.9. The rotor power and torque extraction capabilities from the wind are characterized in respective power and torque coefficient curves. These curves of the actual DOT500 rotor are generated by mapping the actual blade airfoils and applying blade element momentum (BEM) theory (Burton et al., 2011); they are given in Fig. 6 at the blade fine-pitch angle. The fine-pitch angle β0 indicates the blade angle resulting in maximum rotor power extraction in the below-rated operating region (Bossanyi, 2000). 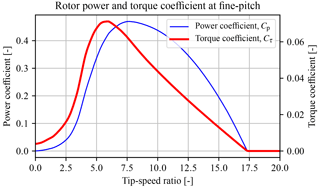 The theoretical maximum rotor power and torque coefficients equal Cp,max=0.48 and Cτ,max⁡=7.2×10-2 at tip-speed ratios of 7.8 and 5.9, respectively. The complete power, torque, and thrust coefficient data set is available as an external supplement under Mulders et al. (2018b). The system torque τsys is supplied by the hydraulic drivetrain to the rotor low-speed shaft. This torque is influenced by the components in the drivetrain, which all have their own energy conversion characteristics expressed in efficiency curves. All components are off the shelf and their combined efficiency characteristics influence the operating behavior of the turbine. Hydraulic components are known for their high torque-to-inertia ratio and have high acceleration capabilities as a result (Merritt, 1967). In typical applications of a hydraulic transmission, the fairly low rotational inertia of pumps and motors is still relevant. However, the considered wind turbine drivetrain is driven by a rotor with a large inertia Jr compared to the drivetrain components. Referring to the specification sheet of the oil motor (Bosch-Rexroth, 2012), it is stated that the unit has a moment of inertia of Jb=0.55 kg m2. The resulting reflected inertia to the rotor of Jb→r=0.55/G2=1533.312 kg m2 is still negligible, where G−1 represents the hydraulic gear ratio of 52.8. Furthermore, a particular study on this aspect has been carried out in Kempenaar (2012), in which it is concluded that the inclusion of component dynamics does not result in significantly improved model accuracy. For the reasons mentioned, the pumps and motor included in the drivetrain are assumed to have negligible dynamics, and the power conversion (flow speed, torque pressure) is given by static relations. Figure 7Flow diagram of the DOT500 hydraulic drivetrain. For steady-state modeling purposes, first the flow path is calculated up to the spear valve. The effective nozzle area and the water flow through the spear valve determine the hydraulic feed line pressure, which influences the system torque τsys to the rotor. 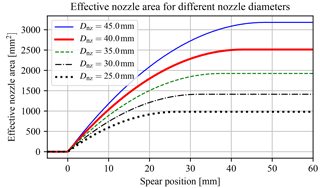 and a mapping for spear position to effective nozzle area for different nozzle diameters Dnz is given in Fig. 9. The spear valve is closed for all cases at position s=0 mm. 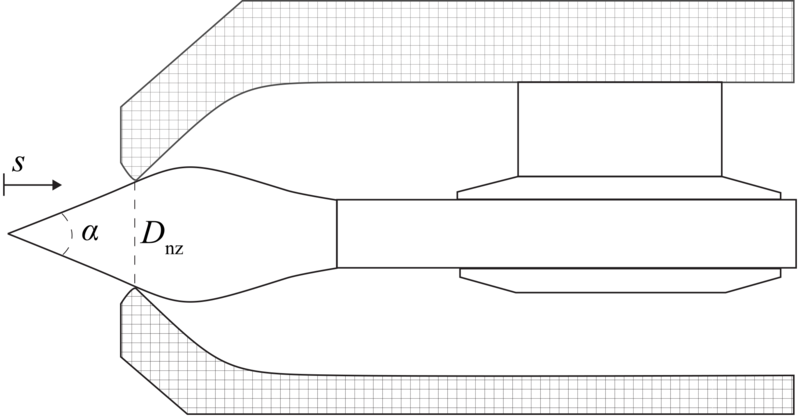 Figure 8Cross section of the spear valve used. The coning angle of the spear is given by α, the nozzle diameter by Dnz, and the position of the spear tip in the nozzle by s. The nozzle heads are adjustable for the adjustment of the outlet area. with the flow and effective nozzle area Qw,Anz⊂R+. As observed in the above given relation, the pressure can be controlled by varying the feed flow and spear position, as the latter influences the effective nozzle area Anz. The discharge coefficient Cd is introduced to account for pressure losses due to the geometry and flow regime at the nozzle exit (Al'tshul' and Margolin, 1968). The discharge coefficient of an orifice is defined as the ratio between the vena contracta area and the orifice area (Bragg, 1960). The vena contracta is the point at which the streamlines become parallel, which usually occurs downstream of the orifice at which the streamlines are still converging. Using the relations derived, a passive strategy for below-rated turbine control is presented in Sect. 4.1. In contrast to the steady-state model presented previously, this section elaborates on the derivation of a drivetrain model including fluid dynamics for validation of the control design in the near-rated region. First, preliminary knowledge on fluid dynamics is given in Sect. 3.2.1, whereafter a dynamic DOT500 drivetrain model is presented in Sect. 3.2.2. The transfer functions defined in Eqs. (17) and (18) show the characteristics of an inverted notch with +1 and −1 slopes on the left and right side of the natural frequency, respectively. This physically means that exciting the system pressure results in a volume velocity change predominantly at the system natural frequency for the former case. An illustrative Bode plot is given in Sect. 4.2.1. Exciting the flow results in amplification and transmission to pressure in a wider frequency region. This effect is a result of the inverse proportionality between the damping coefficients ζQ and ζp (see Appendix B). A dynamic model of the DOT500 drivetrain is derived by application of the theory presented in the previous section. The drivetrain is defined from the rotor up to the spear valve, and the following assumptions are made. Because of the high torque-to-inertia ratio of hydraulic components (Merritt, 1967), the dynamics of oil pumps and motors are disregarded and taken as analytic relations. Because of the longer line length and higher compressibility of oil compared to the shorter water column, the high-pressure oil line is more critical for control design, and a dynamic model is implemented for this column only. The fluids have a constant temperature. where Ke is the equivalent bulk modulus, including the fluid and line compressibility defined in Eq. (A5), and 𝒱 is the net volume inflow to the considered oil line between the oil pump discharge and oil motor feed port. For convenience, mechanical model quantities are expressed hydraulically in terms of fluid flows and pressure differences over the components. Therefore, the rotor inertia Jr is expressed in terms of fluid induction and is combined with the hydraulic induction term into LR*. where ts and tβ are the time constant for the spear valve and pitch actuators, respectively, and the phase loss at the actuator bandwidth is assumed to account for actuation delay effects. 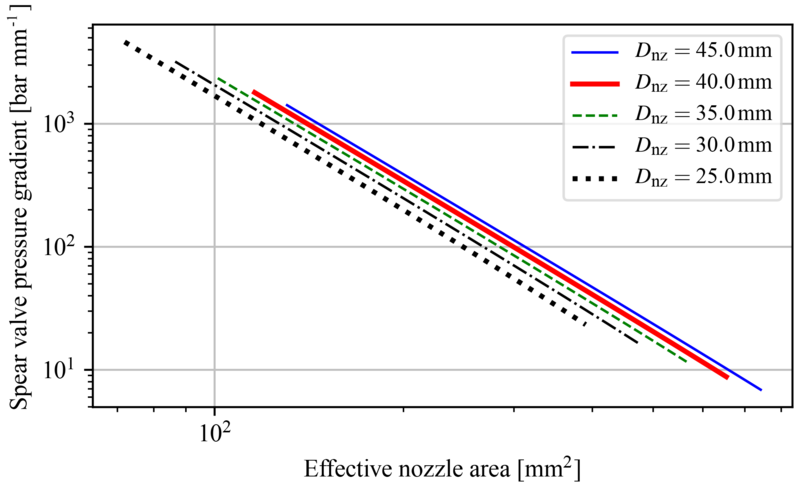 Figure 9Effective nozzle area as a function of the spear position in the circular nozzle cross section. The spear valve is fully closed at s=0 mm and fully opened at s=smax, the latter of which is variable according to the nozzle head diameter. Figure 10The intrinsic speed feedback gain kλ(λ,β‾,U‾) as a function of tip-speed ratio λ at a fixed pitch angle and wind speed of −2∘ and 8 m s−1. Stable turbine operation is attained for nonpositive values of kλ. The dynamic model derived in this section is used in Sect. 4.2 to create an active spear valve torque control strategy in the near-rated region. In this section designs are presented for control in the below- and near-rated operating region. A schematic diagram of the overall control system is given in Fig. 11. It is seen that the turbine is controlled by two distinct proportional–integral (PI) controllers, a spear valve torque, and blade pitch controller acting on individual rotor speed set point errors es and eβ, respectively. As both controllers have a common control objective of regulating the rotor speed and are implemented in a decentralized way, it is ensured that they are not active simultaneously. The gain-scheduled pitch controller is designed and implemented in a similar way as in conventional wind turbines (Jonkman et al., 2009) and is therefore not further elaborated in this paper. The spear valve torque controller, however, is nonconventional and its control design is outlined in this section. For the below-rated control design a passive torque control strategy is employed, a description of which is given in Sect. 4.1. Subsequently, in Sect. 4.2, the in-field active spear valve control implementation is evaluated using the dynamic drivetrain model. where Kr is the optimal mode gain in Nm (rad s−1)−2. Figure 11Schematic diagram of the DOT500 control strategy. When the control error e is negative, the controllers saturate at their minimum or maximum setting. In the near-rated operating region, the rotor speed is actively regulated to ωr,s by generating the spear position control signal sref, influencing the fluid pressure and the system torque. When the spear valve is at its rated minimum position, the gain-scheduled pitch controller generates a pitch angle set point βref to regulate the rotor speed at its nominal value ωr,β. Rotor speed variations cause a varying flow through the spear valve, which results in a varying system pressure and thus system torque, regulating the tip-speed ratio of the rotor. 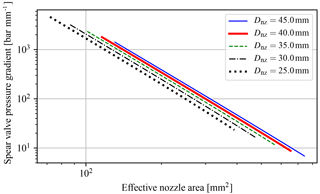 The above-obtained result shows that when Ks is constant, the tip-speed ratio can be regulated in the below-rated region by a fixed nozzle area Anz. Under ideal circumstances, it is shown in Diepeveen and Jarquin-Laguna (2014) that a constant nozzle area lets the rotor follow the optimal power coefficient trajectory and is called passive torque control. This means that no active control is needed up to the near-rated operating region. For this purpose, the optimal mode gain Ks of the system side needs to equal that of the rotor Kr in the below-rated region. However, for the passive strategy to work, the combined drivetrain efficiency needs to be consistent in the below-rated operating region. As seen in Eq. (49), the combined efficiency term is a product of the consequent volumetric divided by the mechanical efficiencies of all components as a function of their current operating point. To assess the consistency of the overall drivetrain efficiency, different operating strategies are examined in Sect. 4.1.1. Subsequently, a component efficiency analysis is given in Sect. 4.1.2. Because hydraulic components are in general more efficient in high-load operating conditions (Trostmann, 1995), it might be advantageous for a hydraulic wind turbine drivetrain to operate the rotor at a lower tip-speed ratio. 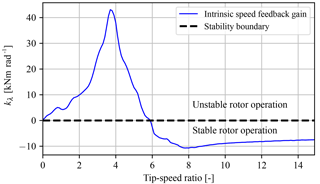 Operating at a lower tip-speed ratio results in a lower rotational rotor speed and a higher torque for equal wind speeds, but at the same time decreases the rotor power coefficient Cp. By sacrificing rotor efficiency, the resulting higher operational pressures might lead to maximization of the total drivetrain efficiency. For these reasons, an analysis of this trade-off is divided into two cases. Case 1: operating the rotor at its maximum power coefficient Cp,max. Case 2: operation at the maximum torque coefficient Cτ,max. 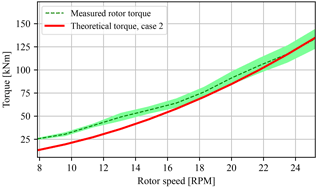 Referring back to the rotor power–torque curve in Fig. 6 and substituting the values for operation at Cp,max and Cτ,max in Eq. 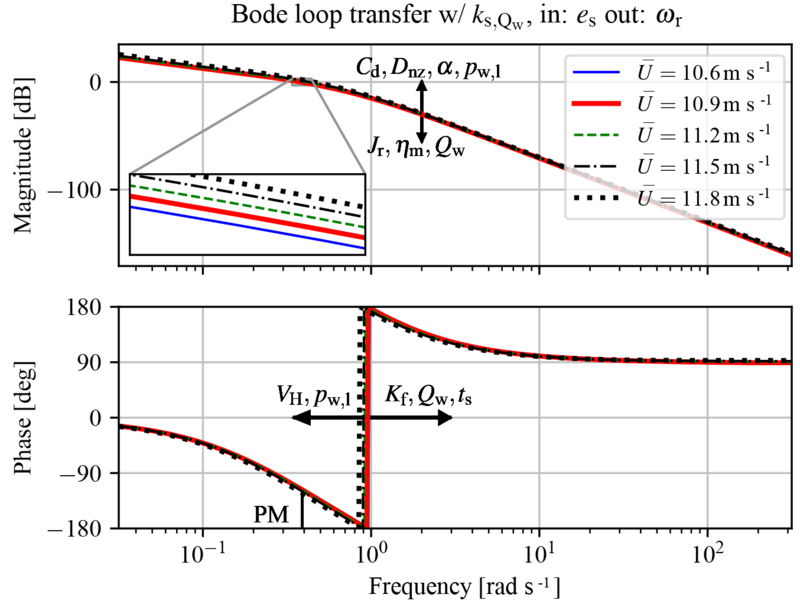 (45), optimal mode gain values of Kr,p=1.00×104 Nm (rad s−1)−2 and Kr,τ=2.05×104 Nm (rad s−1)−2 are found for cases 1 and 2, respectively. 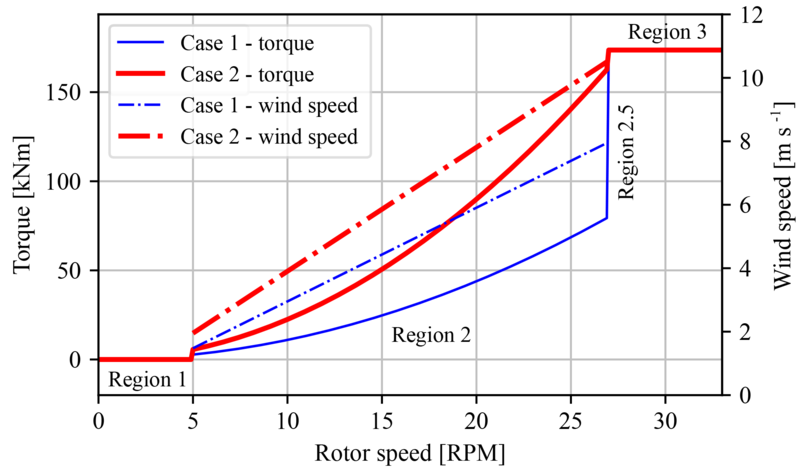 The result of evaluating the rotor torque path in the below-rated region for the two cases is presented in Fig. 12. Due to the lower tip-speed ratio in case 2 , the rotor speed is lower for equal wind speeds or a higher wind speed is required for operation at the same rotor speed, resulting in a higher torque. An efficiency evaluation of the proposed operational cases using actual component efficiency data is given in the next section. This section presents the available component efficiency data and evaluates steady-state drivetrain operation characteristics for the two previously introduced operating cases. The component efficiency characteristics primarily influence the steady-state response of the wind turbine, as shown in Eq. (49). To perform a fair comparison between the two operating cases, the rotor efficiency is normalized with respect to case 1, resulting in a constant efficiency factor of 0.85 for operating case 2. Detailed efficiency data are available for the oil pump and motor; however, as no data for the efficiency characteristics of the water pump are available, a constant mechanical and volumetric efficiency of ηm,k=0.83 and ηm,k=0.93 are assumed, respectively. 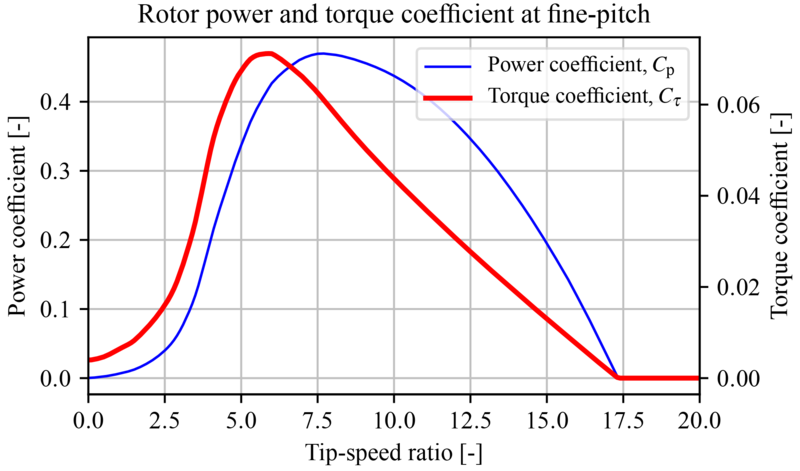 Figure 12Torque control strategies for maintaining a fixed tip-speed ratio λ, tracking the optimal power coefficient Cp,max (case 1) and the maximum torque coefficient Cτ,max (case 2). The dash-dotted lines show the wind speed corresponding to the distinct strategies (right y axis), and the vertical dashed lines indicate boundaries between operating regions. Figure 13Mechanical efficiency mapping of the oil pump and oil motor. Manufacturer-supplied data (blue dots) are evaluated using an interpolation function. Operating cases 1 and 2 are indicated by the solid blue and red lines, respectively. where ηv,h is taken as 0.98, and the result is presented in Fig. 13 (left). The plotted data points (dots) are interpolated on a mesh grid using a regular grid linear interpolation method from the Python SciPy interpolation toolbox (SciPy.org, 2017). Operating cases 1 and 2 are indicated by the solid lines. The same procedure is performed for the data supplied with the oil motor, the result of which is presented in Fig. 13 (right), in which ηv,b is taken as 0.98. As concluded from the efficiency curves, hydraulic components are generally more efficient in the low-speed, high-torque, and/or high-pressure region. 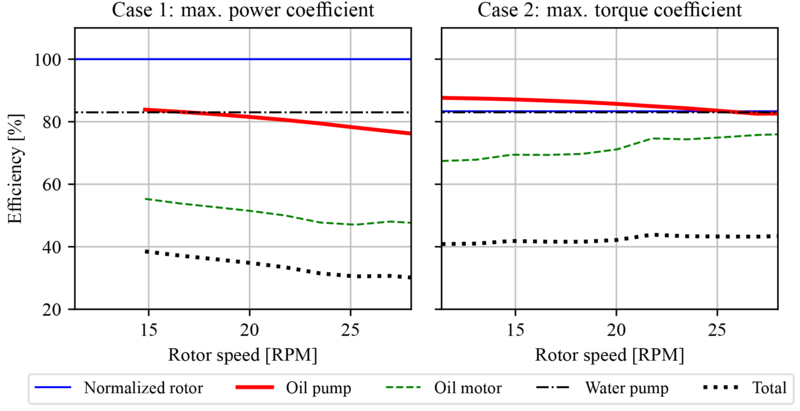 It is immediately clear that for both the oil pump and the motor, operating the rotor at a lower tip-speed ratio (case 2) is beneficial from a component efficiency perspective. The drivetrain efficiency analysis for both operating cases is given in Fig. 14. The lack of efficiency data at lower rotor speeds in the left plot of Fig. 14 (case 1) is due to the unavailability of data at lower pressures. From the resulting plot it is concluded that the overall drivetrain efficiency for case 2 is higher and more consistent compared to case 1. The consistency of the total drivetrain efficiency is advantageous for control, as this enables passive torque control to maintain a constant tip-speed ratio. As a result of this observation, the focus is henceforth shifted to the implementation of a torque control strategy tracking the maximum torque coefficient (case 2). It should be stressed that this operational strategy is beneficial for the considered drivetrain, but can by no means be generalized for other wind turbines with hydraulic drivetrains. As the overall efficiency of hydraulic components is a product of mechanical and volumetric efficiency, a more rigorous approach would be to optimize the ideal below-rated operational trajectory subject to all component characteristics. However, to perform a more concise analysis, only the two given trajectories are evaluated. Figure 14Comparison of the total drivetrain efficiency for operating cases 1 and 2. It is observed that the total efficiency is higher in the complete below-rated region for case 2. The efficiency over all rotor speeds is also more consistent, enabling passive torque control using a constant nozzle area Anz. A stability concern for operation at the maximum torque coefficient needs to be highlighted. For stable operation, the value of kλ needs to be negative. As shown in Fig. 10, the stability boundary is located at a tip-speed ratio of 5.9. Operation at a lower tip-speed ratio results in unstable turbine operation and deceleration of the rotor speed to standstill. However, as concluded in Schmitz et al. (2013), hydraulic drivetrains can compensate for this theoretical instability, allowing for operation at lower tip-speed ratios. Therefore, the case 2 torque control strategy is designed for the theoretical calculated minimum tip-speed ratio of 5.9, and in-field test results need to confirm the practical feasibility of the implementation. A feedback hydraulic torque control is derived for near-rated operation in this section. To this end, active spear position control is employed to regulate the rotor speed. The effect on fluid resonances is analyzed, as these are possibly excited by an increased rotor speed control bandwidth. The in-field tests with corresponding control implementations are performed prior to the theoretical dynamic analysis of the drivetrain. For this reason, the control design and tunings used in-field are evaluated and possible improvements are highlighted. Section 4.2.1 and 4.2.2 define the modeling parameters of the oil column and spear valve actuator, which is used in Sect. 4.2.3 for spear valve torque controller design. 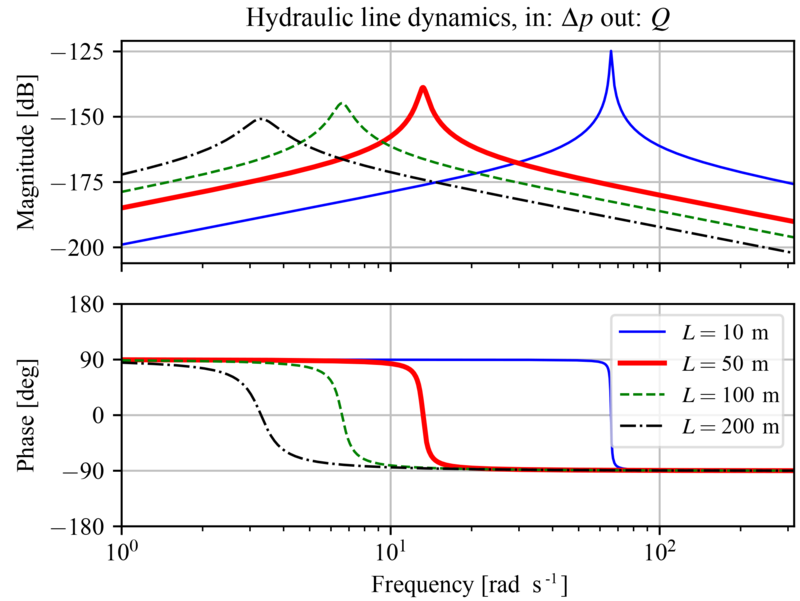 Figure 15Bode plot of a hydraulic control volume modeled as a harmonic oscillator with pressure change Δp as input and flow Q as output. The length of the hydraulic line has a great influence on the location of the natural frequency and magnitude of the damping coefficient. The high-pressure oil line in the DOT500 drivetrain is considered to contain SAE30 oil, with a density of ρo=900 kg m−3 and an effective bulk modulus of Kf,o=1.5 GPa. The hydraulic line is cylindrical with a length of Ll=50 m, a radius of rl=43.3 mm, and a bulk modulus of Kl=0.80 GPa (Hružík et al., 2013). According to Eq. (A5), the equivalent bulk modulus becomes Ke=0.52 GPa. The dynamic viscosity of SAE30 oil is taken at a fixed temperature of 20 ∘C, at which it reads a value of μ=240 mPa s. With these data the hydraulic inductance, resistance, and capacitance have calculated values of LH=7.64×106 kg m−4, RH=8.69×106kg m−4 s−1, and 1/CH=1.77×109 kg m−4 s−2, respectively. Using Eq. (B4), the flow is calculated to be laminar as Re=1244 with oil flow at a nominal rotor speed of 1478 L min−1, and thus a correction factor fc=4/3 is applied to the hydraulic inductance. By substitution of the calculated values in Eq. (17), a visualization of the transfer function frequency response is given in Fig. 15 at a range of hydraulic line lengths. In this Bode plot, it is shown that the line length has a great influence on the location of the natural frequency and damping coefficient. A longer line shifts the frequency to lower values and increases the damping coefficient. For determining the time constant ts of the spear valve actuator model defined in Eq. (22), a generalized (pseudo-random) binary noise (GBN) identification signal (Godfrey, 1993) is supplied to one of the spear valve actuators. From this test it is seen that the actuator has a fixed and rate-limited positioning speed of s˙max=0.44 mm s−1 and shows no observable transient response. Because of the nonlinear rate-limited response, an actuator model is parameterized for the worst-case scenario. 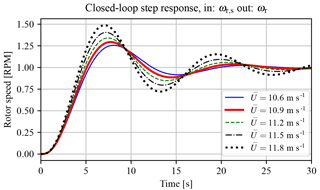 This is done by evaluating the response at maximum actuation amplitude and determining the corresponding bandwidth such that closed-loop reference position tracking is ensured. As concluded from in-field experiments, the spear position control range in the near-rated operating region is 1.5 mm, and the corresponding time constant for reference tracking is given by ts=1.69 s.
The spear position relates in a nonlinear fashion to the applied system torque as a consequence of the spear valve geometry presented in Figs. 8 and 9. Therefore, in Fig. 16, an evaluation of the spear valve pressure gradient with respect to the spear position ks,s is given. This is done for distinct nozzle head diameters at a range of effective nozzle areas. It is shown that the spear pressure gradient with respect to the position is higher for larger nozzle head diameters at equal effective areas. 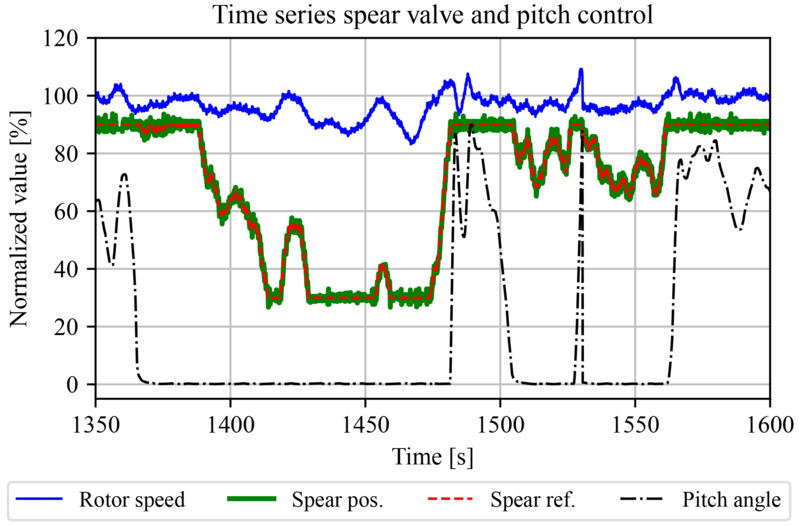 The active spear valve torque control strategy employed during the in-field tests is now evaluated. A fixed-gain controller was implemented for rotor speed control in the near-rated region. As the goal is to make a fair comparison and evaluation of the in-field control design, the same PI controller is used in this analysis. The dynamic drivetrain model presented in Sect. 3.2 is further analyzed. The linear state-space system in Eq. (40) is evaluated at different operating points in the near-rated region. The operating point is chosen at a rotor speed of ωr,s=27 RPM, which results in a water pump discharge flow of Q‾w=2965 L min−1, taking into account the volumetric losses. For the entire near-rated region, a range of wind speeds and corresponding model parameters are computed and listed in Table 2. An analysis is performed on the single-input single-output (SISO) open-loop transfer system with the speed error es as input and rotor speed as output, including the spear valve PI torque controller used during field tests. The gains of the PI controller were Kp=3.8×10-3 m (rad s−1)−1 and Ki=6.6845×10-4 m rad−1. Figure 16Spear valve position pressure gradient evaluated for different nozzle head diameters at a range of effective nozzle areas. The pressure sensitivity is higher for larger nozzle diameters at equal effective areas. Results are presented in a double logarithmic plot. Table 2Parameters for the linearization of the model in the near-rated operating region. By inspection of the state A matrix, various preliminary remarks can be made regarding system stability and drivetrain damping. First it is seen that for the (2, 2) element, the hydraulic resistance RH influences the intrinsic speed feedback gain kQin*. It was concluded in Sect. 4.1.2 that the rotor operation is stable for negative values of kωr and thus kQin*. Thus, the higher the hydraulic resistance, the longer the (2, 2) element stays negative for decreasing tip-speed ratios, resulting in increased operational stability. This effect has been observed earlier in Schmitz et al. (2012, 2013), in which it was shown that turbines with a hydraulic drivetrain are able to attain lower tip-speed ratios. This is in accordance with Eqs. (B7) and (B8), in which it is shown that the resistance term only influences the damping. Furthermore, the spear valve pressure feedback gain ks,Qw provides additional system torque when the rotor has a speed increase or overshoot, resulting in additional damping to the (3, 3) element in the state matrix. During analysis, an important result is noticed and is shown by discarding and including the spear valve pressure feedback gain ks,Qw in the linearized state-space system. 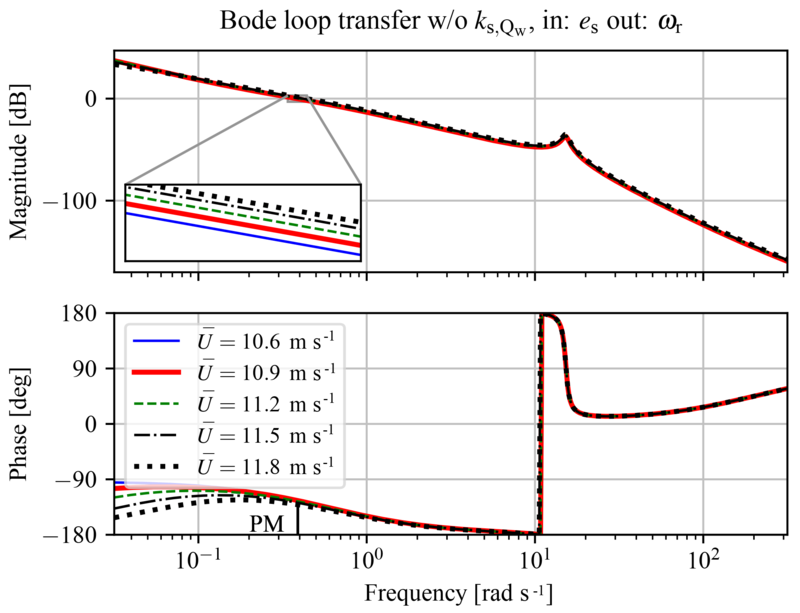 The open-loop Bode plot of the system excluding the term is presented in Fig. 17 and including the term in Fig. 18. It is noted that the damping term completely damps the hydraulic resonance peak in the oil column as a result of the intrinsic flow pressure feedback effect. At the same time, the attainable bandwidth of the hydraulic torque control implementation is limited. This bandwidth-limiting effect becomes more severe by applying longer line lengths and thus larger volumes in the discharge line, as it increases the hydraulic induction. Fortunately, various solutions are possible to mitigate this effect and are discussed next. The effect of increasing different model parameters is depicted in Fig. 18. In the DOT500 setup an intermediate oil circuit is used, which is omitted in the ideal DOT concept. Seawater has a higher effective bulk modulus compared to oil and this has a positive effect on the maximum attainable torque control bandwidth for equal line lengths. Moreover, a faster spear valve actuator has a positive influence on the attainable control bandwidth. From both figures it is also observed that the system dynamics change according to the operating point. At higher wind speeds, the magnitude of response results is higher. The effect was seen earlier in Fig. 16, in which the pressure gradient with respect to the spear valve position is higher for smaller effective nozzle areas. It is concluded that the sizing of the nozzle diameter is a trade-off between the minimal achievable pressure and its controllability with respect to the resolution of the spear positioning and actuation speed. 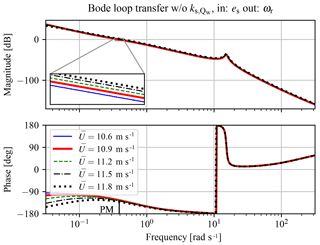 The loop-shaped frequency responses attain a minimum and maximum bandwidth of 0.35 and 0.43 rad s−1 with phase margins (PM) of 64 and 58∘, respectively. For later control designs a more consistent control bandwidth can be attained by gain-scheduling the controller gains on a measurement of the water pressure or spear position. 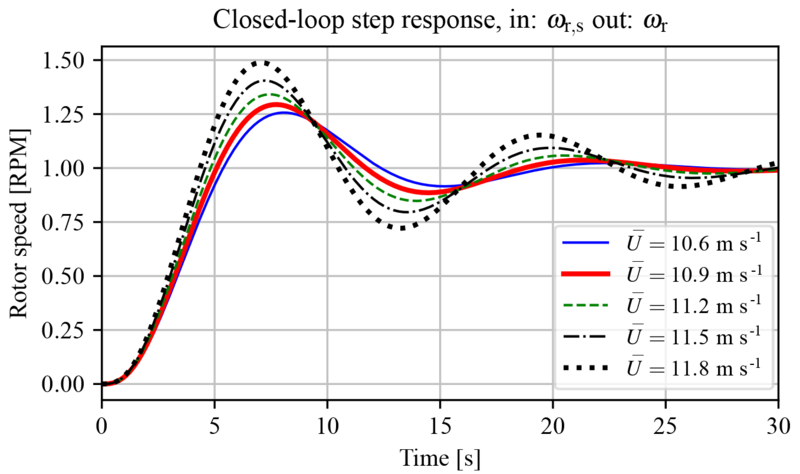 Closed-loop step responses throughout the near-rated region (for different wind speeds) are shown in Fig. 19. It is seen that the controller stabilizes the system, and the control bandwidth increases for higher wind speeds. Figure 17Bode plot of open-loop transfer, including controller from spear valve position reference to the rotor speed, without spear valve pressure feedback gain ks,Qw. The phase margin (PM) at magnitude crossover is indicated. Figure 18Bode plot of the plant for transfer from spear valve position reference to the rotor speed, with spear valve pressure feedback gain ks,Qw. The effect of increasing important model parameters on the frequency response is indicated, together with the phase margin (PM) at the magnitude crossover frequency. This section covers the implementation and evaluation of the derived control strategies on the real-world in-field DOT500 turbine. In accordance with the previous section, a distinction is made between passive and active regulation for below- and near-rated wind turbine control, respectively. To illustrate the overall control strategy from in-field gathered test data, operational visualizations are given in Sect. 5.1. Evaluation of the effectiveness of the passive below-rated and active near-rated torque control strategy is presented in Sect. 5.2. Figure 19Closed-loop step responses of the spear valve torque control implementation. It is shown that the feedback loop is stabilized, but that the dynamics vary with increasing wind speeds. A control implementation that takes care of the varying spear valve position pressure gradient would load to a more consistent response. Figure 20Steady-state rotor torque and speed at predefined spear valve positions (nozzle areas) and wind speed conditions. The red line indicates the operation strategy at fixed spear valve position in the below-rated region, whereas the blue trajectory indicates active spear valve position control towards rated conditions. The effect of blade pitching is indicated in green. 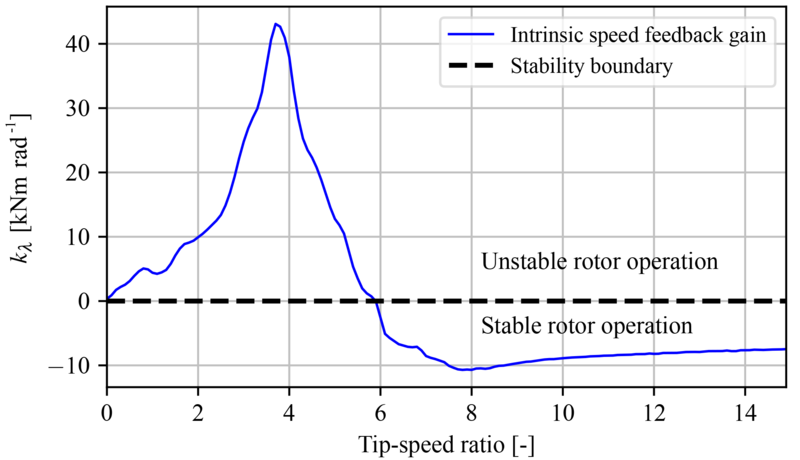 To illustrate the overall control strategy, three-dimensional rotor torque and rotor speed plots are shown as a function of spear position and wind speed in Fig. 20. By fixing the valve position at a range of positions, making sure that sufficient data are collected throughout all wind speeds and binning the data accordingly, a steady-state drivetrain performance mapping is derived. Both figures show the data binned in predefined spear valve positions and wind speeds. 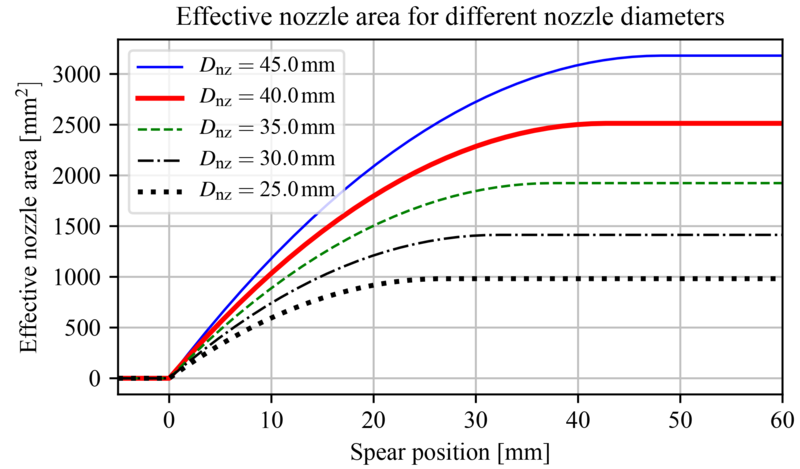 This is done on a normalized scale, on which 0 % is the maximum spear position (larger nozzle area) and 100 % the minimum spear position (smaller nozzle area). The absolute difference between the minimum and maximum spear position is 1.5 mm. The spear position is the only control input in the below-rated region and is independent from other system variables. During data collection, the pitch system regulates the rotor speed up to its nominal set point value when an overspeed occurs. In both figures the control strategy is indicated by colored lines. For below-rated operation (red), the spear valve position is kept constant: flow fluctuations influence the water discharge pressure and thus the system torque. In near-rated conditions (blue), the spear position is actively controlled by a PI controller. Under conditions of a constant regulated water flow corresponding to ωr,s=27 RPM, the controller continuously adjusts the spear position and thus water discharge pressure to regulate the rotor speed. Once the turbine reaches its nominal power output, the rotor limits wind energy power capture using gain-scheduled PI pitch control (green), maintaining the rotor speed at ωr,β=28 RPM. Figure 21Tip-speed ratio mapping as a function of spear valve position and rotor speed (a). The dashed line indicates the fixed spear position selected for below-rated passive torque control. Panel (b) shows the corresponding evaluation of the tip-speed ratios along this path with 1σ standard deviation bands. Previously, in Sect. 4.1, drivetrain characteristics are deduced from prior component information throughout the wind turbine operating region. Characteristic data from the rotor, the oil pump, and the oil motor are evaluated to generate a hydraulic torque control strategy. Due to the predicted consistent mechanical efficiency of the hydraulic drivetrain, the nozzle area can be fixed and no active torque control is needed in the below-rated region. 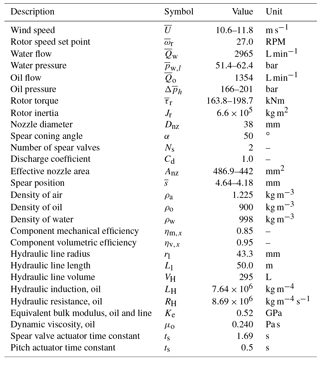 This results from the rotor speed being proportional to water flow and relates to system torque according to Eq. (49). From the analysis it is also concluded that operating at a lower tip-speed ratio results in a higher and more consistent overall efficiency for this particular drivetrain. As concluded in Sect. 4.1.2, stable turbine operation is attained when the rotor operates at a tip-speed ratio such that kλ is negative, and Fig. 10 shows that the predicted stability boundary is located at a tip-speed ratio of λ=5.9. Using the data obtained from in-field tests, a mapping of the attained tip-speed ratios as a function of the spear valve position and rotor speed is given in Fig. 21. An anemometer on the nacelle and behind the rotor measures the wind speed. As turbine wind speed measurements are generally considered less reliable (Østergaard et al., 2007) and the effect of induction is not included in this analysis, the obtained results serve as an indication of the turbine behavior. The dashed line indicates the fixed spear position of 70 % and is chosen as the position for passive torque control in the below-rated region. The attained tip-speed ratio averages are presented in Fig. 21a, and Fig. 21b shows a two-dimensional visualization of the data indicated by the dashed line, including 1 standard deviation. Closing the spear valve further for operation at an even lower tip-speed ratio and higher water pressures resulted in a slowly decreasing rotor speed and thus unstable operation. In Fig. 21, it is shown that the calculated tip-speed ratio is regulated around a mean of 5.5 for below-rated conditions. Although the attained value is lower than the theoretical calculated minimum tip-speed ratio of 5.9, stable turbine operation is attained during in-field tests. A plausible explanation is that the damping characteristics of hydraulic components compensate for instability as predicted in Sect. 4.2.3. Figure 22 shows reaction torque measurements by the load pins in the suspension of the oil pump to estimate the attained rotor torque during below-rated operation. From the tip-speed ratio heat map and the rotor torque measurements it is concluded that the case 2 (maximum rotor torque coefficient) strategy works on the actual turbine, and the passive strategy regulates the torque close to the desired predefined path. However, as seen in both figures for lower rotor speeds, the tip-speed ratio attains lower values and the rotor torque increases. An explanation for this effect is the decreased mechanical water pump efficiency, the efficiency characteristics of which, as stated earlier, are unknown. An analysis of the water pump efficiency is performed using measurement data and shows nonconstant mechanical efficiency characteristics: the efficiency drops rapidly when the rotor speeds is below 15 RPM. 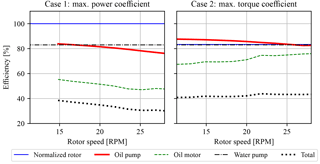 Figure 22Evaluation of the passive torque control strategy by comparison of the theoretical torque for case 2 to the torque measured by load pins in the oil pump suspension. For higher speeds, the passive torque control strategy succeeds in near-ideal tracking of the desired case 2 path. At lower rotor speeds, the torque is higher than the aimed theoretical line as a result of the lower combined drivetrain efficiency in this operating region. Finally, the active spear valve torque control strategy is evaluated. The aim is to regulate the rotor speed to a constant reference speed in the near-rated operating region. In-field test results are given in Fig. 23, in which the environmental conditions were such that the turbine operated around the near-rated region. All values are normalized for convenient presentation. 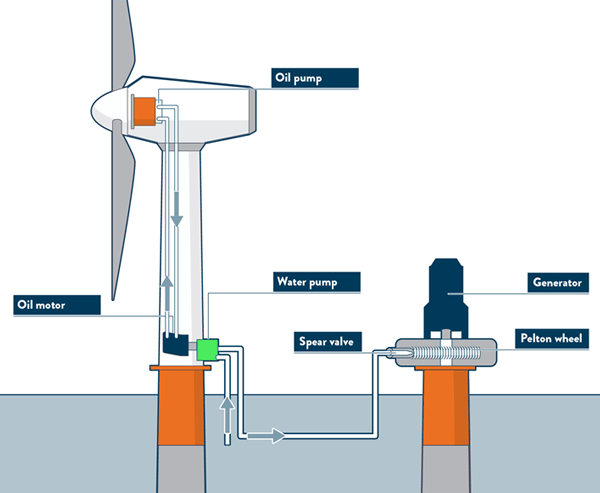 It is shown that active spear valve control combined with pitch control regulates the wind turbine for (near-)rated conditions in a decentralized way. Small excursions to the below-rated region are observed when the spear valve position saturates at is minimal normalized value. 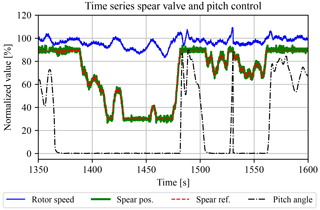 The spear position tracks the control signal reference and shows that the strategy has sufficient bandwidth to act as a substitute for conventional torque control. 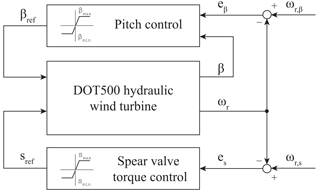 This paper presents the control design for the intermediate DOT500 hydraulic wind turbine. This turbine with a 500 kW hydraulic drivetrain is deployed in-field and served as a proof of concept. The drivetrain included a hydraulic transmission in the form of an oil circuit, as at the time of writing a low-speed high-torque seawater pump was not commercially available and is being developed by DOT. First it is concluded that for the employed drivetrain, operating at maximum rotor torque, instead of maximum rotor power, is beneficial for drivetrain efficiency maximization. This results not only in an increased overall efficiency, but comes with an additional advantage of the efficiency characteristics being consistent for the considered drivetrain. From a control perspective, a consistent overall drivetrain efficiency is required for successful application of the below-rated passive torque control strategy. Another benefit of the hydraulic drivetrain is the added damping, enabling operation at lower tip-speed ratios. It is shown using in-field measurement data that the passive strategy succeeds in tracking the torque path corresponding to maximum rotor torque for a large envelope in the below-rated region. For a smaller portion, the combined drivetrain mechanical efficiency drops, which results in deviation from the desired trajectory. Figure 23A time series showing the hydraulic control strategy for the DOT500 turbine. 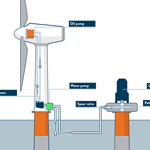 The spear valve position actively regulates the rotor speed as a substitute for conventional turbine torque control. In the above-rated region, pitch control is employed to keep the rotor at its nominal speed. All signals in this plot are normalized. Secondly, a drivetrain model including the oil dynamics is derived for spear valve control design in the near-rated region. It is shown that by including a spear valve as a control input, the hydraulic resonance is damped by the flow-induced spear valve pressure feedback. 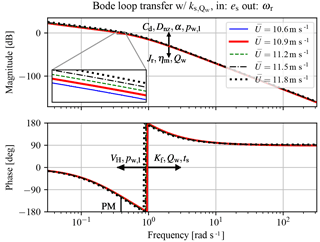 This intrinsic pressure feedback effect also limits the attainable torque control bandwidth. However, this limiting effect can be coped with by using a stiffer fluid, a decreased hydraulic line volume, or a faster spear valve actuator. The sizing of the nozzle head diameter influences the pressure sensitivity with respect to the spear position and affects the attainable control bandwidth by spear valve actuation speed constraints and positioning accuracy. 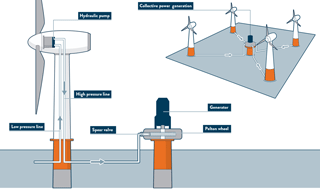 In-field test results show the practical feasibility of the strategy including spear valve and pitch control inputs to actively regulate the wind turbine in the (near-)rated operating region. Future control designs will be improved by including a control implementation taking into account the varying spear valve pressure gradient. This will result in a higher and more consistent system response. The ideal DOT concept discards the oil circuit and only uses water hydraulics with an internally developed seawater pump. As a result, the control design process is simplified and the overall drivetrain efficiency should be greatly improved. Future research will focus on the design of a centralized control implementation for DOT wind turbines acting in a hydraulic network. The data set and code used in this paper are available under https://doi.org/10.5281/zenodo.1405387 (Mulders et al., 2018b). with the assumption that the flow speed profile is radially uniform (Akers et al., 2006). For this reason, a distinction should be made between laminar and turbulent flows in circular lines: the induction of a laminar flow is generally corrected by a factor fc=4/3, whereas a turbulent flow does not need correction with respect to the fluid inertia If (Bansal, 1989). which is a constant term independent of the flow rate. 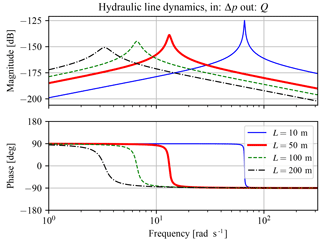 For a turbulent fluid flow, the computation of the resistance is more involved and results in a quantity that is dependent on the flow rate and effective pipe roughness. For simulation purposes this would require reevaluation of the resistance in each time step or for each operating point during linear analysis. Such a nonlinear time-variant (NLTV) system is employed in Buhagiar et al. (2016), updating the resistive terms in each iteration for a hydraulic variable-displacement drivetrain with seawater under turbulent conditions. and thus the hydraulic capacitance CH is directly proportional to the volume amount and gives the pressure change according to a net flow variation into a control volume. where Dl=2rl is the line diameter, and μ the fluid dynamic viscosity. For Reynolds numbers larger than 4000 the flow is considered as turbulent and the inertial terms are dominant, whereas for values smaller than 2300 the viscosity terms are deemed dominant. The research presented in this paper was part of the DOT500 ONT project, which was conducted by DOT in collaboration with Delft University of Technology and executed with funding received from the Ministerie van Economische zaken via TKI Wind op Zee, Topsector Energie. The modeling, operating strategy, and controller design for an actual in-field wind turbine with a fixed-displacement hydraulic drivetrain are presented. An analysis is given on a passive torque control strategy for below-rated operation. The turbine lacks the option to influence the system torque by a generator, so the turbine is regulated by a spear valve in the region between below- and above-rated operation. 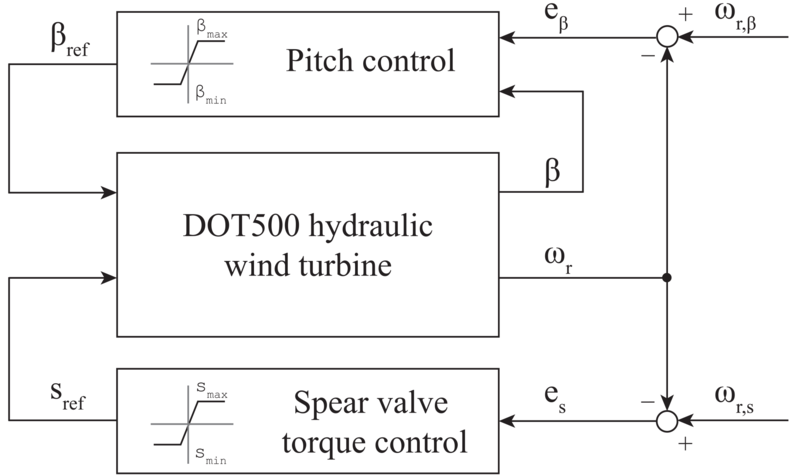 The control design is evaluated on a real-world 500 kW hydraulic wind turbine.